Lease the 2019 Audi Q5 2.0T Premium quattro for $4995 down and $419/mo for 39 months. Lease the 2019 Audi Q7 2.0T Premium quattro for $4995 down and $499/mo for 39 months. 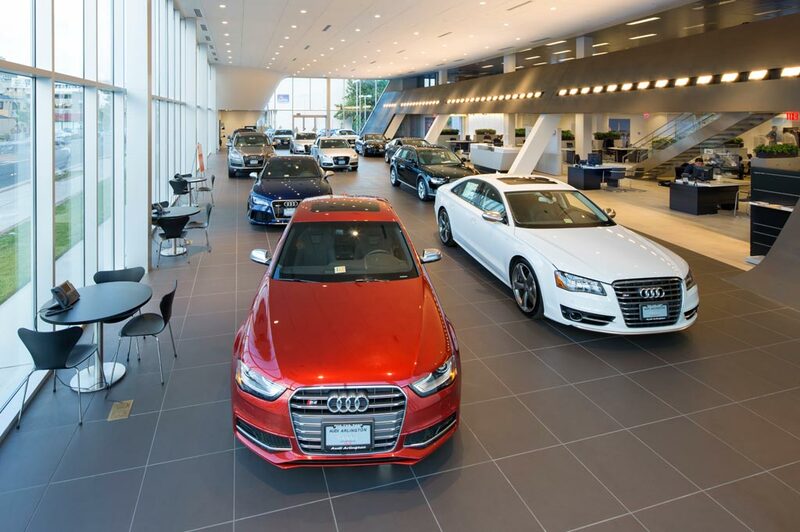 With a diverse collection of new cars for sale, Prestige Audi in Lakewood, Colorado, makes car-shopping a refreshing experience. From the spacious Audi Q7 and Audi Q5 to the sleek and sporty Audi A6, we have the classics and the latest models. Choosing an Audi means choosing luxury and style. Whether you are after a state-of-the-art new model or wish to take a look at our used car dealership, we're confident you'll find something you love. If you're thinking pre-owned is the way to go, why not check out our certified used inventory? These vehicles have been thoroughly inspected to meet your needs. Our finance center can help whether you're looking to finance or lease, and you can get things started by pre-qualifying right on our website. From oil changes and tire rotations to replacement parts, our Audi service center is here to help, providing service coupons to make sure you get a great deal. When it's time to buy a new vehicle or service your current one, think Prestige Audi. Contact us online or call (877) 663-9259 with any questions. Serving: Lakewood, CO, Denver, CO, Westminster, CO, and Golden, CO.
For the most complete selection of luxury cars and SUVs in Lakewood, Colorado, come down to Prestige Audi. When you visit Prestige Audi, located at 9201 W. Colfax Avenue Lakewood, Colorado, you will quickly discover why we are a premier new and used car dealership. Our friendly and knowledgeable sales team will make sure to answer all questions or concerns that you might have. Come see why thousands of customers near Denver, Golden and Westminster, CO choose Prestige Audi. The experienced staff at our Audi dealership know the ins and outs of every single 2017 or 2018 Audi model, including the A5 Sportback, A4, Q5, Q3. Come down to Prestige Audi and see what makes us a preferred Audi dealership in Lakewood, Colorado. Among the many things drivers notice and appreciate about our new Audi lineup, is its diversity. That said, there are a few resounding favorites, such as the A4, A5, A6, Q5 and A8. To see what all of the fuss is about, simply drop by Prestige Audi of Lakewood and take a spin. Prestige Audi knows that a brand new 2018 Audi might not fit your budget at this time. That's why our dealership also offers a huge inventory of Certified Pre-Owned Audi and used cars in Lakewood. In addition to pre-owned vehicles from Audi, but we also have a large selection of vehicles from other automakers as well. To see what we have currently available, peruse our online inventory, and be sure to stop by to see us in person as well. Audi Financing Services Available in Lakewood - Prestige Audi Makes Buying an Audi Simple and Fun! If you already have your next new or used car picked out, let the Audi financing experts at Prestige Audi help you get behind the wheel fast. Whether you're looking to secure an Audi lease and loan, Denver, Golden or Westminster, we can work with you to help make sure you don't overextend yourself. After all, we'd expect the same from you if we put ourselves in your shoes. When you are in need of Audi service, our dealership is the place to go. We offer a wide range of car repair and auto services for the Lakewood area. Our staff of highly trained auto mechanics is ready to take care of your Audi today. We will repair your vehicle quickly and correctly so you will not have to return to our Lakewood dealership time after time. We also have a large Audi car parts to get you the car parts you need for your A4, A5, A6, Q5, A8, or other model. Dress up your vehicle with auto accessories from our Lakewood auto accessories department too. Feel free to contact Prestige Audi today online or by phone at (303) 238-8101 if you have any questions or if you'd like to schedule a service appointment now. We look forward to meeting you soon and serving you for many more years to come. Audi Dealer Selling New Audi and Pre-Owned Vehicles.